Be aware that all material in this study is copyrighted and that printed copies are available and catalogued (1st edition ISBN 90-9013158-2; 2nd edition ISBN 90-806552-1-X; 3rd edition ISBN 978-90-806552-2-5). It may be self-evident from the title of this study that the author of the music itself represented in the note examples in this study is Frank Zappa, of which the copyright since his death has gone over to the Zappa Family Trust. The inclusion of music examples in this study is based upon the right to quote. - The I-depot, The Hague. - The Dutch National Library (Koninklijke Bibliotheek), The Hague. Moreover I deposit the content of every update at the I-depot, The Hague. So I can prove my copyright on the entire content of this site at any moment. The Berne Convention regulates copyright in general terms. Most countries have signed the convention, among them the U.S. and the European countries. National legislation can give a further detailing of copyright. Copyright includes music transcriptions as regulated via article 2, item 3, of the Berne Convention. 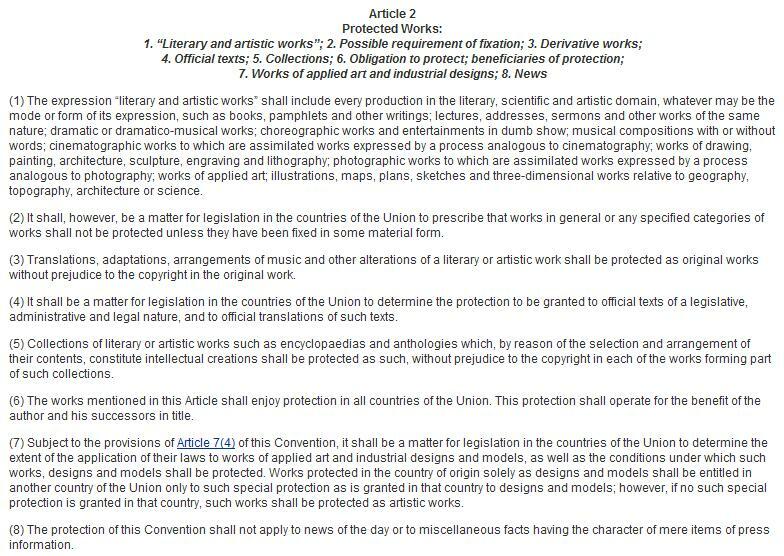 The Berne Convention regulates copyright in general terms. Most countries have signed the convention, among them the U.S. and the European countries. National legislation can give a further detailing of copyright. The most relevant passages for the copyright of this study are reproduced below. Of course one shouldn’t take over transcriptions in this study blindfoldedly and check them first. You can add corrections to it or replace it if a transcription appears to be clumsily done, but if the result is largely the same the (co-) credit goes to the original transcriber. There’s no difference between finding or transcribing something yourself and copying it, changing the words or some of the notes. This article about derivative works means that in case of for instance a music transcription, there's a double copyright. The ZFT has the copyright on the music itself and the transcriber has a copyright on the transcription. This may look odd at first reading, but the intention of the legislator is here to protect the effort of transcribing. Suppose this wasn't the case, then you could take a page by Steve Vai from the Guitar book, make some cosmetic changes upon it, and then say that it's your transcription. That then would be legal and undermine the work by Steve Vai. You don't do that with transcriptions by Vai, not the Hal Leonard series, and, when you're re-using one of my examples, you don't do that with my transcriptions neither. If you want to call something yours it has to be substantially different or the overlap should be small, like a complete song compared to a note example. I'm an academic with a few commercial books published on history subjects (in Dutch). Musical analysis is hard to commercialize, so in this case I chose for the net. I'm aware that for academic purposes this is a lesser medium, so you can refer to the pages from the pdf or earlier printed versions. These are hard versions. Since I found overlapping analytical text blocks and/or transcriptions in two recent publications, I'm considering exposing this as copyright infringements if this happens again in the future. It already looks stupid when you call something yours when it's largely identical to already published material. But when you're presenting other people's note examples as if you've transcribed them from record, while it includes elements that aren't even played like that on album, then you don't even have to ask if you've been copying material. You've provided the evidence yourself. Strictly speaking it is a form of plagiary. So don't do things like that. Better one reference too many than one too little.